Goldstein Research analyst forecast the Nano Chemotherapy Market size is set to reach USD 3.5 billion by 2024, at a CAGR of 7.45% over the forecast years. 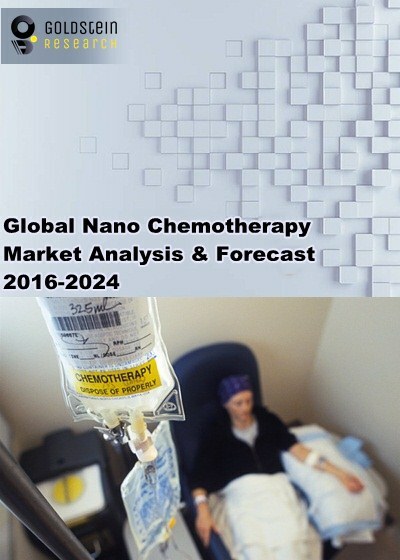 The report covers the present ground scenario and the future growth prospects of the Nano Chemotherapy Market for 2016-2024 along with prevalence of the target diseases and the information of upstream raw materials sourcing and downstream buyers. We calculated the market size and revenue share on the basis of revenue generated from major players, revenue of nanomedicine clinical pipeline and sales of nano chemotherapeutic drugs in Nano Chemotherapy Market across the globe. On the basis of type, medicine therapy holds the major portion of market share i.e. approximately 67% of total nano chemotherapy market owing to the release of the pipeline products under clinical trials in coming time span. While physical therapy segment tends to increase at the considerable CAGR due to the availability of early detection techniques that require only physical therapy to withstand the diseases. Nano Chemotherapy Market Outlook 2016-2024, has been prepared based on an in-depth market analysis from industry experts. The report covers the competitive landscape and current position of major players in the global Nano Chemotherapy Market. The report also includes porter’s five force model, SWOT analysis, company profiling, business strategies of market players and their business models. Global market report also recognizes value chain analysis to understand the cost differentiation to provide competitive advantage to the existing and new entry players. Our global Nano Chemotherapy Market report comprises of the following companies as the key players in the Nano Chemotherapy Market: Ablynx, AMAG, Amgen, Celgene, CytImmune, Cornerstone, Delpor, Ensysce, MagForce, Merrimack, Nanotherapeutics, Nanobiotix, Nanospectra, Spectrum pharmaceuticals, Tarveda. According to the report, major driving factor for expansion of Nano Chemotherapy Market is the presence of bioavailability-improved nanoscale particles and molecules in order to make drug delivery focuses on maximizing bioavailability both at specific places in the body and over a period of time. Further, the report states that the major challenge in Nano Chemotherapy Market is that several “nano-carriages” for drug delivery to the right address are present but many challenges remain, chief among them being how not to let the medicine act before it gets to the right place in the body. The carriers usually encapsulate drugs through long-range electrostatic interactions wherein the carrier attracts oppositely charged medicine. Other tools are available to trigger the release of drugs making it difficult to reach out at the exact target location. Based on geography, North America dominate the Nano Chemotherapy Market with 40.12% market share while Europe hold the promising future potential for this market and tends to grow at a CAGR of 8.49% over the forecast period. Countries such as Denmark, France, Australia, Belgium, Norway, US, Ireland and South Korea hold the opportunities in nano chemotherapy market owing to the highest cancer rate for men and women. What is the revenue of Nano Chemotherapeutics in clinical trials in 2015-16 and what would be the expected demand over the forecast period?